Back by popular demand, our Big Zucchini Contest will take place August 15th. Bring in your homegrown zucchini for judging between 9:00 am and noon. Zucchini must be grown in Teton County Idaho or Wyoming. Contest is free to enter and fun for all ages. The winner gets bragging rights and a $50 MD gift card. While many people may think of roses as fussy and delicate, there are several hardy varieties like Morden roses, Adelaide Hoodless and Nearly Wild that will bloom continually through the summer. We love the colorful choices of this super tough plant. Available in sunset colors, pinks and white, yarrow is also deer and vole resistant. 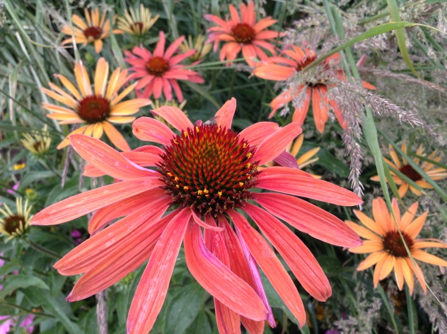 Also known as coneflower, Echinacea is typically purple or white, but newer varieties of orange and yellow are beginning to become popular. Echinacea is an excellent cut flower and attracts butterflies. August is the time ornamental grasses really start to shine. Their seed heads shimmer in the golden sunlight and the gentle sway of their stems add a magical element to any landscape. See our August 2014 newsletter for more info. Sedums come in many forms. Most begin to bloom late summer. Bloom colors vary from pink to yellow and white. Use sedums as ground covers, in rock gardens or try them in a container (see the following container recipe). Taller varieties like ‘autumn joy’ really pack a late season color punch, especially when planted in masses. 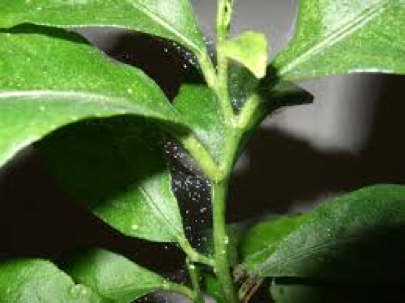 Hosing: A strong jet of water can destroy webbing, knock down and kill spider mites. Beneficial Insects: Ladybugs, sold commercially, can also be released under mite-infested plants to feed on mites. Avoiding strong insecticides such as those containing sevin, malathion and imidacloprid that kill mite’s natural enemies will actually help avoid mite infestations. 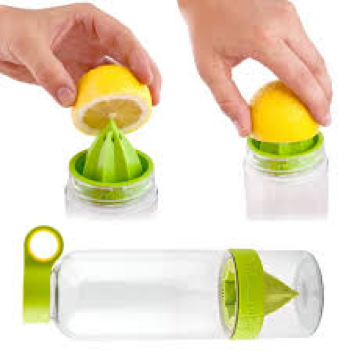 Sulfur: This is often sold as a multipurpose spray such as Safer™ Brand 3 in 1 Garden Spray. Always follow the directions on the label. Horticultural Oil: This is possibly the best control available for the home gardener. The oil suffocates the eggs and the adults. Always follow the directions on the label. Maintaining healthy plants will also help avoid mite infestations. Plants stressed by drought or lack of nutrients are prone to insect problems. 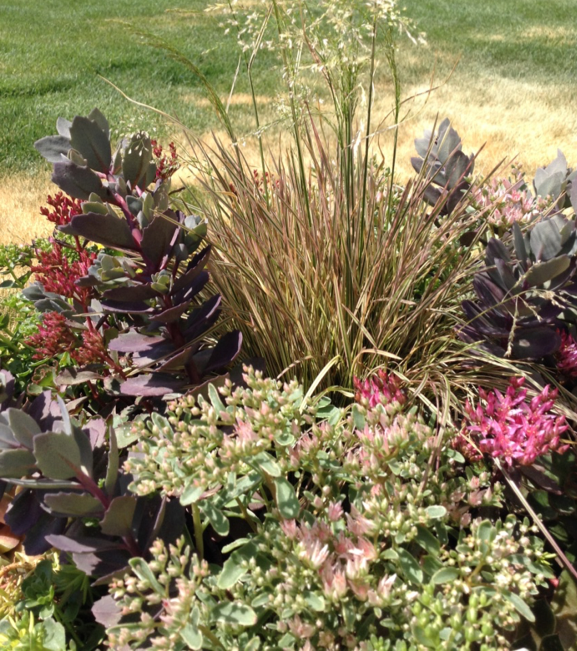 Choose a variety of sedums and ornamental grasses. Play around with a combination of heights, leaf colors and textures. Be creative and have fun! Choose a taller grass for the center or back third of the planter. Fill in with medium and low growing varieties, saving the lowest varieties for the edge of the planter. Plan on using about 3- 4 inch plants per 12 inch diameter container. Place in full sun and water thoroughly. Check water every few days and water only when potting soil feels completely dry. This simple side dish comes together quickly and is a great way to feature August’s bountiful zucchini. Prepare grill and preheat to medium high. Cut the zucchini into 1 inch rounds. Brush each side with olive oil and sprinkle with salt and pepper. Grill zucchini rounds until slightly charred on each side and it begins to soften, about 6-8 minutes total. Remove from grill, cut into bite-sized chunks and place in a shallow serving bowl. 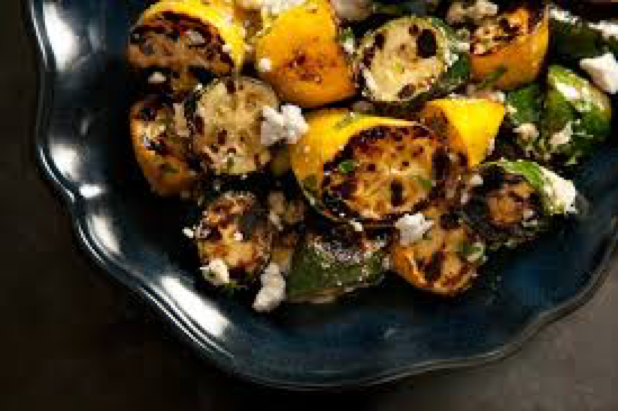 Combine lemon juice, zest and oil and toss with warm zucchini chunks. Add salt and pepper to taste and sprinkle with feta and fresh herbs. Serve warm or at room temperature. A Tree! Yes, you can plant a tree in August. We like maples and ash trees for instant shade in your yard.